Trust Muc-Off to keep your bike clean and lubed so you can ride for longer. 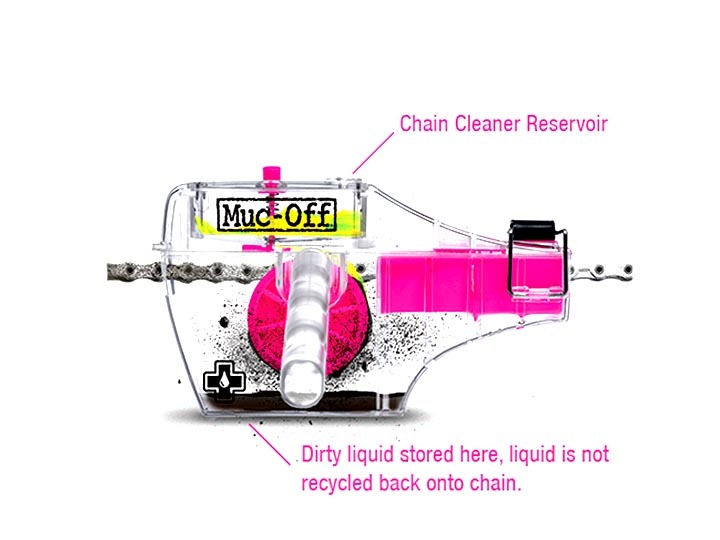 The Muc-Off X-3 Chain Machine helps chains that suffer from regular grit and grime build up; this patent pending ergonomic design boasts a heavy-duty construction and can clean your chain in seconds. The only way to get the best out of your chain and its running efficiency is to make sure it's regularly and properly cleaned and lubed. The X-3 Dirty Chain Machine is by far the easiest way to give your chain a good scrub. Included in the kit is a 75ml measure of Muc-Off Drivetrain Cleaner. This revolutionary little liquid can be either sprayed over the drivetrain or poured directly into the top reservoir of the machine, which is then released by a control button. This ensures the application of the cleaner is quick and easy to control. The X-3 machine and Drivetrain Cleaner partner up to attack the worst of grease and grime from every possible angle to deliver the ultimate, deep clean on even the dirtiest bike chains. The abrasive cleaning teeth and rotating brush wheels which have 120 contact points cover all areas of the individual chain link for a deep and thorough clean. Finally the excess dirty fluid drops into a second lower reservoir so it’s kept away from the clean chain - no more recycled grime all over the chain! Muc-Off Drivetrain Cleaner is fully biodegradable and is safe to be disposed of down the drain if you previously used one of our bio chain lubes!